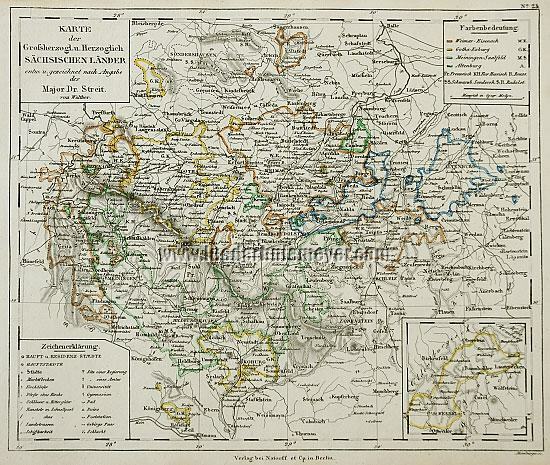 Saxony – (Saxon States, Map of the Grand Ducal + Ducal.) With title & 2 explanation cartouches and small separate map of the western possession of Idar-Oberstein – Birkenfeld – Ottweiler. Detail map by Walther after Friedrich Wilhelm Streit (Ronneburg, Thuringia, 1772 – Berlin 1839) in steel engraving by A. Heimburger, colored in outline. (1833-37.) 9¼ × 10⅞ in (23.4 × 27.5 cm). Rich local references including postal routes + stations, navigabilities, mountain passes, universities + high schools . – Up to Bleicherode – Halle – Penig – Plauen – Münchberg – Thurnau – Haßfurt – Hünfeld – Waldkappel . – Finely situated at Saale + environment i. a. Kösen, Camburg, Dornburg, Lobeda, Kahla, Rudolstadt, Saalfeld + Schwarzburg. In the left marginal area Eisenach. Weissenfels + Naumburg as postal stations at “Artificial Street” with express service. – Centered on Weimar – Rudolstadt .